Comfortable 'fabulously convenient' accommodations for up to seven in this three bedroom, three bathroom private house, just a snowball’s throw from the base of Peak Eight and the Breckenridge Nordic Center. Two off street parking spots. The main floor includes the living room, dining area, and a well-equipped gourmet kitchen. Best of all, soak and warm your bones in the private hot tub on the patio - wonderful after a full day skiing, shopping, or cross country skiing. The third floor includes a Master Suite with its own bath and shower stall, king size memory foam bed, TV with cable and DVD/VHS player, and windows that face Baldy Mountain. The second bedroom has king size bed. The third bedroom has a bunk bed with a full size on the bottom and a twin on top. An additional full bathroom is located between the bedrooms. The lower level includes a gas fireplace with a fold out couch, and a 30 inch TV with cable and DVD/VHS player and stereo system. A full bathroom is located on the lower level. High speed wireless Internet access is available throughout the house. You won’t need a car once you’re here. The free shuttle stop is directly in front of the house with regularly scheduled free shuttles to the lifts at Peak 7, Peak 8, Peak 9, and to downtown Breckenridge shopping and dining. Additionally, connect to free transportation to Keystone, A-Basin, Copper Mountain, Frisco, Silverthorne Outlets, and other popular Summit County destinations. At the end of your day, return home by having the free shuttle drop you off directly in front of the house. Use the 'Email Owner' Feature on this Page to Submit Your Inquiry. Samsung Blue Ray player downstairs. DVD/VHS player in master bedroom. There is a free bus system in town that takes you to the ski area. www.breckfreeride.com The Black bus stops in front of the house at the Gold Camp bus stop. Thank you for your positive feedback on the house! We pride ourselves in extremely clean homes. The location of this property is fabulous for accessing the ski area. We hope to see you again soon! We really enjoyed our stay at this house - it has a double driveway off a side road so parking is plentiful and the Free Bus stops right in front of the house so getting to the ski slopes or into town is extremely convenient. Walking to peak 8 lifts takes only 9 minutes in ski/snowboard boots. The home itself is beautiful with all the amenities you could need and plenty of cookware. The owners are readily available and swing by if requested to check on the hot tub or reset a breaker. Excellent choice for vacation and as an added bonus, the new years fireworks are only a mile or so away and can be seen from the hot tub without having to go anywhere! This house was an awesome place to stay in Breckenridge! It was located directly across the street from the free town shuttle. It was less than a five minute bus ride to the base of Peak 8 so you could be skiing within minutes of leaving the house. The house was great and had everything we needed to make our vacation awesome!! Plenty of space!! Owners were great and very nice. Will stay here again if it is available when we come back to the great town of Breckenridge!! Perfect location on Peak 8! 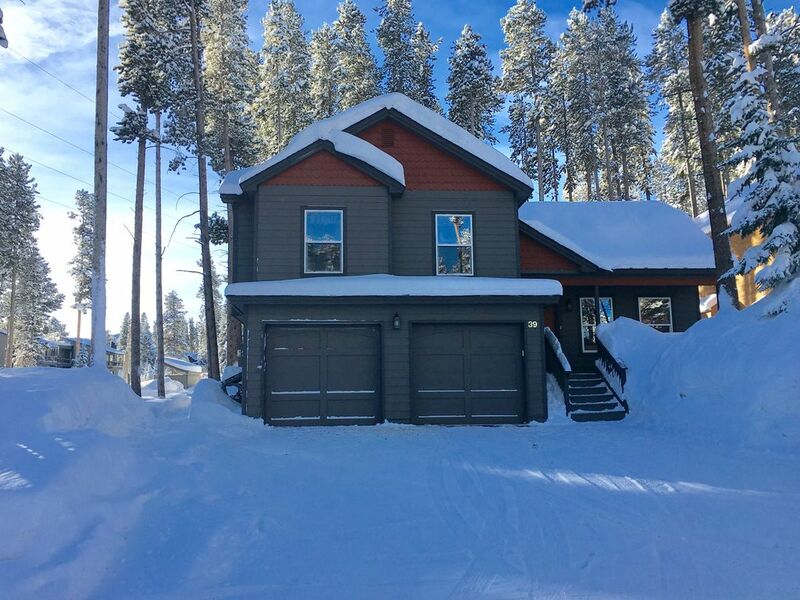 My husband and I found this home to be perfect for our Christmas week vacation with our kids who live in Breck. The open living area was warm, roomy and inviting for our Christmas celebration with them and their friends. The kitchen was generously stocked with everything you need to prepare a feast from cookware to serveware to small appliances. We loved using the over-sized white Pottery Barn plates for our Christmas dinner. The king bed in the master was very comfortable. We ended up not using the other 2 bedrooms. The bus stop is located directly in front of the property and is the last stop before the Peak 8 base, making it only a few minutes from the front door to the lift line. We also rode the bus to Main Street, which was less than a 5-minute ride. The private hot tub was great after a long day of skiing and for relaxing in the evening. We so appreciated the fact that the house was clean, clean, clean! And the owners came by to shovel our drive and sidewalk when necessary. We would highly recommend this property and look forward to staying here again in the future.